Budget negotiations at the end of the legislative session typically focus on one or two sticking points. In recent years of tight budgets those negotiations between caucuses in both chambers have centered on oil tax credits and funding the state’s education and ferry systems; this year, it appears, it will all be about the PFD. Gov. Michael J. Dunleavy largely campaigned on returning to the statutory Permanent Fund dividend formula after three years of lawmakers deviating from it while the state was mired in multibillion-dollar budget deficits. Dunleavy emphasized on the campaign trail that improved oil prices could support current levels of state spending as long as future budget growth was mostly limited to match inflation. It wasn’t until the very end of the campaign and more so after the election — when oil prices fell from near $80 per barrel to eventually stabilize in the mid-$60 range, and expected state revenue dropped in concert — that talk began of major budget cuts to pay for a $3,000 PFD this year. While the newly-elected governor has subsequently chosen to start budgeting by paying a full PFD and proposing major budget cuts to resolve the $1.6 billion deficit at current spending levels using the remaining revenue from all sources, legislative leaders are taking a much different approach. A full, statutorily calculated PFD for the upcoming 2020 state fiscal year is expected to cost about $1.9 billion. House Finance Committee co-chair Rep. Neal Foster, D-Nome, said during a March 28 press briefing that the bipartisan House majority caucus would focus on the budget first and address the dividend with the remaining funding available. “We’re working in House Finance to construct a budget that is fiscally responsible and at the same time funds the things that Alaskans are asking for,” Foster said. He and his fellow Finance co-chair North Pole Republican Rep. Tammie Wilson said they’re looking to make gradual budget cuts over several years to allow government agencies and the businesses that work with them time to react to reductions. Foster suggested legislators could appropriate this year’s PFD in a new, drastically amended version of the governor’s bills to repay forgone dividend amounts, which don’t appear likely to pass as the administration has proposed. The first version of the House budget — also subject to several rounds of amendments — calls for $45 million in cuts to General Fund spending but is more than $1 billion less than the current 2019 budget mostly because it does not include the PFD appropriation that has generally been in the operating budget bill. “I think one of the things we realized is we have to do business different,” Wilson said. “We can’t just keep cutting; we have to change” state government operations to maintain some services at lower spending levels. House Speaker Bryce Edgmon, I-Dillingham, said the eight community meetings representatives held across the state in late March drew an overwhelming response in opposition to Dunleavy’s budget plan. Specifically, individuals testifying against the governor’s budget cuts outweighed those in favor of them by a five-to-one margin, according to Edgmon. 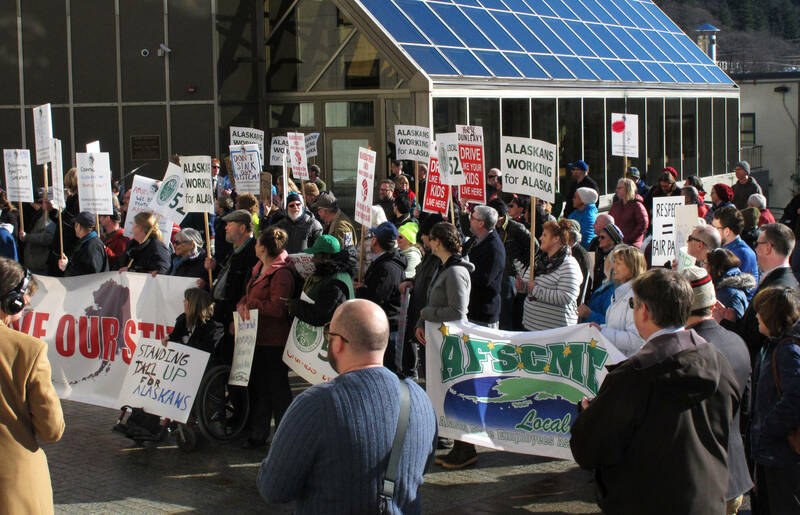 The number of Alaskans who testified in community and Finance meetings in support of generally reducing the PFD to pay for government services also outweighed those opposed to PFD cuts by three-to-one based on a tally kept by the majority caucus. “A lot of Alaskans, not all, but a lot of Alaskans are willing to take a reduced PFD in order to protect schools and public safety and road services and other essential items,” Edgmon described. Elsewhere in the Capitol, senators are discussing the prospect of changing the PFD to better match the state’s new fiscal situation. Senate Finance co-chairs Natasha von Imhof, R-Anchorage, and Bert Stedman, R-Sitka, said March 27 that they are working on a new dividend formula that would better fit within the framework of the Permanent Fund percent of market value, or POMV, draw legislation passed last year. The POMV law calls for drawing 5.25 percent of the five-year average Permanent Fund value from the $64-billion fund’s Earnings Reserve Account, which this year amounts to a $2.9 billion draw to pay dividends and support government services. In an interview, von Imhof said the PFD bill would make the dividend a portion of the overall POMV draw on the fund. The current formula is based on a portion of the annual average income the fund produces and changing it to split the POMV would align the currently incongruent statutes, she said. It would also stabilize future dividend amounts, the senators noted. What exactly the proposed split will be is unclear at this point, but it doesn’t appear likely it will be weighted towards dividends. A 50-50 split of the POMV draw would lead to a roughly $2,300 PFD this year, but also leave a deficit of $861 million, according to Senate Finance calculations. Sen. Lyman Hoffman, D-Bethel, said he agrees that the size of the dividend should be debated. However, he and others from both parties contend the PFD should be enshrined in the Alaska Constitution for the simple reason that otherwise it will continue to be a political talking point since the Legislature and former Gov. Bill Walker set the precedent of diverging from the historical formula the past three years. “If we do not resolve the issue on a permanent basis and let the people of Alaska decide what (the PFD) might be we are setting ourselves up for decades to come of making the dividend a political discussion for everyone’s election,” Hoffman said. Wilson said House members also heard in their community meetings that many Alaskans were frustrated not so much by the concept that the PFD formula could change, but that it seemed to be “picked out of the sky” of late. Anchorage Democrat Sen. Bill Wielechowski, who unsuccessfully sued Walker for his 2016 partial veto of the PFD appropriation, emphasized that until the PFD statue is changed the Legislature needs to work within the confines of the existing law. “The reason the dividend was set up was because you had a system where the rich and powerful and the politically connected would come in and take an inordinate share of the government’s wealth and the Permanent Fund dividend program was set up so it was shared equally,” said Wielechowski, who advocates for changes to the state’s oil tax system to generate more revenue. He has also sponsored resolutions to put the PFD in the Constitution, a concept von Imhof rejects. She argues that no allocations were included in the Alaska Constitution because those who wrote it had the foresight to not bind future lawmakers to obligations they might not be able to fulfill. “We have no idea what the future holds. We must be able respond to any set of unknown circumstances that might occur. You have emergencies; you have economic expansion projects; debt service, et cetera,” von Imhof said. In the committee hearing she described the concept of putting the PFD in the Constitution as valuing the “individual over the community”.